From the early nineteenth century to the 1940s, the majority of the population of Newfoundland was involved in the inshore fishery (carried out close to shore, using small boats less than 35 feet in length) and the production of dried and salted codfish. Male family members - fathers, husbands, sons and brothers - caught the fish using small boats and gear such as handlines and cod traps, while the "shore crew" (consisting of mothers, wives, daughters, sisters and younger sons), would split and salt the fish. The women would then take the salted fish and spread them onto wooden fish flakes, or racks to dry in the sun until cured. The women tended the fish, taking it in each night, or during rainy weather. Besides curing the fish, women also provided the basic needs of the family by gardening, preserving food and making clothing. Unidentified Women Hay Making, n.d. Courtesy of The Rooms Provincial Archives Division (CMCS a18-173), St. John's, NL. 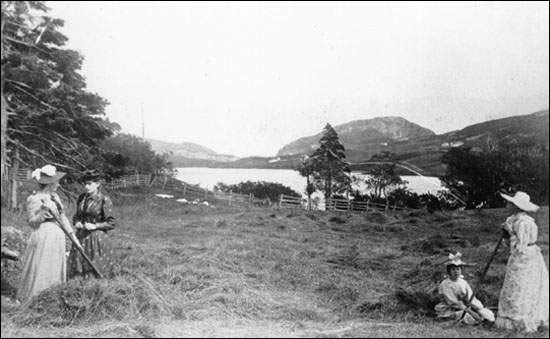 According to the Newfoundland Census of 1891, of the total number of people engaged in catching and curing fish in Newfoundland, 18,000, or 33% were female. In 1901, women comprised 34% of fishery workers and in 1911 it was 35%. By 1921, nearly 25,000 women (38% of the total), worked in the fishery. In some communities, the percentage of females working in the fishery was even higher. Women in Grand Bank fulfilling one of their many roles in the fishery. Women were often acknowledged as shouldering half the load of work in rural households. In the inshore fishery, women's toil often made the difference between survival and starvation. Beginning with World War II, the Newfoundland fishery, and women's roles within it, changed dramatically. Women began finding work in frozen fish processing plants. Fish plant work differed in many ways from fish-curing work on shore. In the fish plants, labour was divided into a number of different tasks. After the fish was loaded onto the production floor, the larger cod was put through machines that split, skinned and de-boned it. Smaller cod, and other species such as redfish were usually cut by hand. The fish was then sent to trimmers and graders, where it was sorted by size and defects were removed. 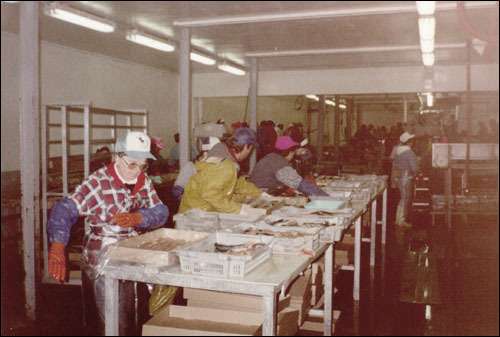 Fish was then weighed and packed into boxes or freezing trays and sent to the freezers. After it was frozen, the fish was moved into the cold storage area where it awaited shipment. Reproduced by permission of the Department of Trade and Technology, Government of Newfoundland and Labrador. From Newfoundland Dept. of Fisheries, Fish is the future: the	development program for the Newfoundland and Labrador fishing industry to 1985. (St. John's, ©1978) 13. 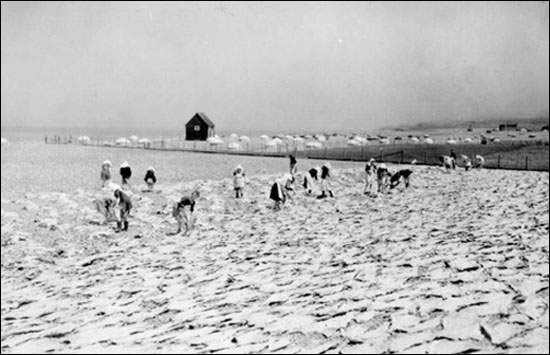 Although women regularly performed all of the processing tasks in the shore fishery, from splitting and cleaning, to salting and drying, to loading and stacking the finished product, the range of tasks they tended to perform in the frozen fish production process was more limited. Men predominate as filleting, skinning and boning machine operators, hand cutters, freezer operators and cold storage operators. Women tend to occupy packing and weighing jobs. Both men and women occupy trimming and grading positions. These divisions are not uniform in all plants - in some plants, there are women hand cutters and skinners, but in others, only men perform those jobs. The jobs where females predominate - packing and weighing - are among the lowest paid occupations in the plants. On the other hand, the jobs where males predominate - operating filleting machines and freezing equipment - are the highest paid jobs. Supervisory and plant manager positions are held overwhelmingly by males. Despite the lower pay, women have been an important part of the fish plant labour force. According to census figures, in 1961, women made up 20% of all fish plant workers. 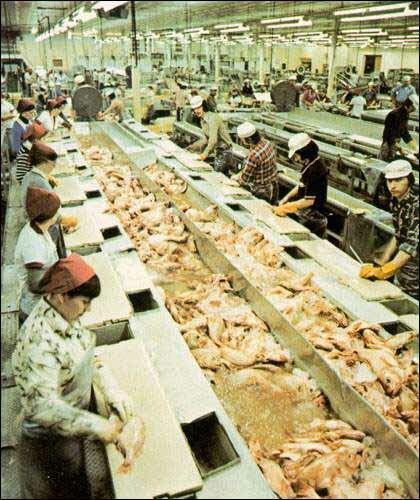 By 1991, 60 percent of fish plant workers were female. By 1991, 60 percent of fish plant workers were female. Before the 1970s, women were only rarely involved in catching fish. Although much of this was due to social pressures which discouraged women from entering "male" roles, government regulations also played a role in preventing women from taking to the boats. Since 1957, self-employed fishers have been eligible to collect Unemployment Insurance during the off season. Those same regulations, however, stipulated that women married to fishers could not collect benefits, even if they fished every day during the fishing season. The assumption was that women who fished with their husbands were only "helping" and therefore their work was not considered valid. Two main factors led more women to start fishing. As years of declining inshore landings had increased the costs of operating a small-boat fishery, more women began fishing with their husbands to keep a greater share of the fishing income in the family. Secondly, in the 1980s, a woman fisher named Rosanne Doyle of Witless Bay, Newfoundland, successfully challenged the Unemployment Insurance regulations which denied benefits to wives of fishers. Women who worked with their husbands on their boats became eligible to collect Unemployment Insurance benefits. By 1991, 1,190 women (11% of all fishers) were working as fish harvesters. In the early 1990s, the cod which had been the mainstay of the Newfoundland fishery for centuries, virtually disappeared as years of overfishing finally took their toll. In 1992, the Canadian government declared a moratorium on cod fishing in Newfoundland. Rural fishing communities have been devastated by the closure. Although much of the attention has been paid to the plight of the male fishers, women have been hard hit by this social and economic crisis. Before the moratorium, an estimated 15,000 women were directly employed in the fishery as fishers and plant workers. Many others lost jobs in businesses that were connected to the fishery. Nearly 10,000 women were eligible for compensation packages from the federal government, but those programs ended in 1998. Since the collapse of the cod, the Newfoundland fishery has employed a much smaller number of people, mostly in the crab and shrimp fishery. Competition for licences and processing jobs has been intense. Despite making up such a large percentage of the fisheries workforce, women have had little say in government policy, in union activities and plant management. During the moratorium, women across the fishery have begun to come together to address the specific problems of female workers and to discuss strategies for change. Whether or not women will have fair access to the wealth generated by the marine resources of the future, however, remains to be seen.